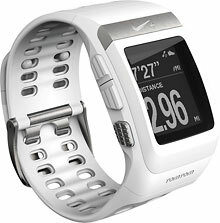 Our second new Tom Tom-powered device is the Nike Plus SportWatch GPS. Joy’s been walking and jogging up a storm with it. The watch comes with a tiny sensor you put in or near your shoe. Nike even makes shoes with a small pocket in the heel to hold the sensor. Not having the fancy Nikes, Joy dropped the sensor into her sock and got on the treadmill. That was to see if the distance tallied by the device matched the treadmill count. It did. The watch has large numbers you can easily read without bending close. It tells you the distance travelled, calories burned, walking or running pace, and laps if you’re going round a track. You can do all this without a sport watch if you download the Nike running app to your smartphone or iPod. (Joy has an armband from Marware that holds her iPod.) Since the app is free, compared with $149 for the sport watch, there’s a significant savings. On the other hand you would lose the coolness factor of wearing the sport watch, and people who are hip, fast-moving and aware may not speak to you.